StingRay Manufacturing LLC, a Missouri based company, was founded in 2009 by a team of engineers, led by Marc Treppler, who previously worked at the MART Corporation and holds multiple patents on parts washers. MART Corporation, one of the leading manufacturers of aqueous parts washers since its founding in 1971, ceased operations in early 2009. Subsequently, several MART engineers formed StingRay Manufacturing. Using their many years of experience in designing and building heavy duty aqueous parts washers for MART, the team integrated numerous design improvements resulting in the StingRay Parts Washer. 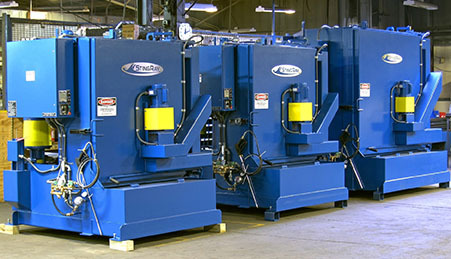 The StingRay Industrial Parts Washer is unique in the industry as it uses the hydraulic force of impact pressure for cleaning rather than flooding dirty parts with hot washing solution. Based on developments by MART founder, Gary Minkin and patents by Chief Engineer Marc Treppler (now StingRay President), the StingRay technology difference lies in its patented, non-synchronized, oscillating manifold system that blasts parts from a different angle each time the part passes on the rotating turntable providing thousands of angles of impingement. Learn more. Hidden recesses and blind areas of parts that fixed manifold systems miss are effectively cleaned with the oscillating manifold. This technology combined with heavy-duty, high-efficiency pumping systems and high output heating systems delivers faster cleaning cycles and more thorough cleaning results. Quality is a way of life at StingRay - Our signature attention to detail, dedicated and experienced team and rigorous quality system assure your parts washer is fully functional before it leaves the factory. Each StingRay parts washer is engineered to run flawlessly, with proven reliability backed by a comprehensive warranty program. Learn more. We know that you have a choice when it comes to selecting a parts washer supplier so our engineers carefully analyzed the work volume, load capacity, duty type, heating and pump performance of other parts washer manufacturers to help you compare. We then took this information and developed a manufacturers comparison chart including parts washers and jet spray washers from StingRay, JRI Industries, PMW Equipment ( RG Hanson, Roto-jet, Stoelting & ALKOTA ), Better Engineering, Safety-Kleen, Cuda ( Landa & Hotsy ) and Proceco. Learn more. No virtual product here. Find out our philosophy and passion for building StingRay parts washers and see photos of our team as they complete various processes leading to the creation of a StingRay. Learn more. Watch your parts washer take shape on our factory floor. The StingRay build record is a weekly status update with photographs of your washer as it is built in our factory. Receive your machine's target ship date immediately after you place your order. Learn more. See what others have to say about their experience working with StingRay. View Testimonials. StingRay is proud to have manufactured parts washers for companies around the globe. Our machines are found in China, Russia, Australia, Chile, Canada, USA, United Kingdom, Taiwan, Mexico, Columbia, Africa and others.